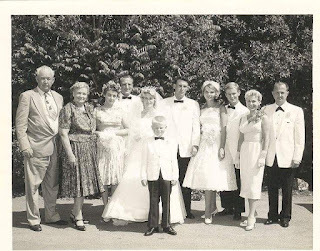 One of my older brother's who's mother is the bride in this picture of my dad's first wedding sent this picture over when he visited my younger brother. 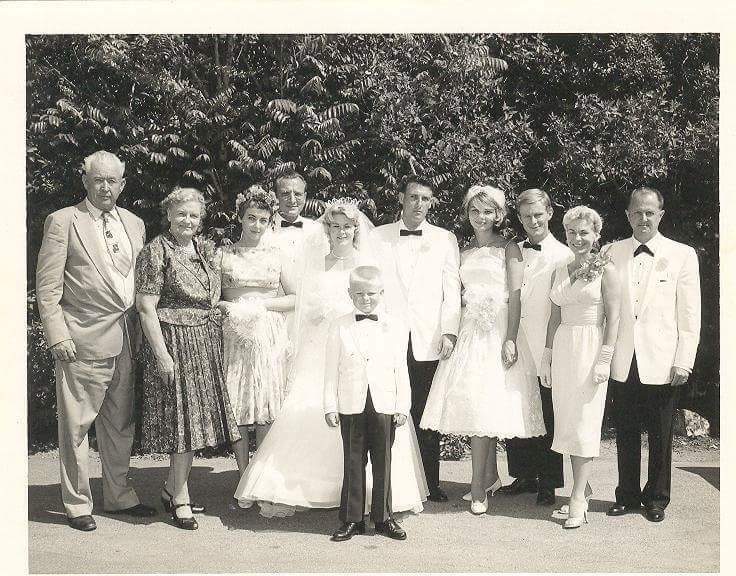 I'd never seen this picture before but loved it because not only did it have a picture of my dad where he's really young but on the left side are my grandfather, grandmother, aunt and uncle. The people on the right are family of my dad's first wife. I don't have many pictures of my aunt and uncle since my aunt passed away from cancer before I was born and my uncle also passed away from cancer while I was very young. I'd never seen any wedding pics from my dads first marriage so it was interesting. Sure look like a happy bunch indeed. Fun to find old pictures and have a look. It was sure interesting to see. Aren't their clothes so fun to see? Gorgeous! It was. I don't have many pictures of them all together so it was interesting. That's wonderful and I can see what you love it. So very kind that they sent the photo to you. My brother didn't know that we hadn't seen these pictures. It is. That's why I love all my photo albums. That must be nice to see an older picture of your family! It must have been back in the late 1950's. How cool. I don't think I have any photos of my father when he was younger. What a great picture. I'd be lying if I didn't admit to being a little jealous. Never had a big family, much less a picture with them. I have a large family but I'm not real close with most of them. What a neat photo to come across!